Tax refund offsets are one of the government’s powerful tools to collect federal student loans. The government may take your income tax refund if you are in default. A number of states also have laws that authorize state guaranty agencies to take state income tax refunds. Computer records of all borrowers in default are sent to the I.R.S. Borrowers in default can expect to have all or a portion of their tax refund taken and applied automatically to federal student loan debt. You can request a hearing to challenge the tax offset. The I.R.S. has said that you must appeal to the Department of Education if you want to challenge an offset after it’s already been done. The Department of Education provides this explanation of tax offsets. Get started by finding out what kind of loan you have. You are eligible for a closed school discharge or false certification discharge. If you want the offset to be on hold while you are challenging it, you must file a request for review at the address written in the offset notice by the later of 65 days after the date of the notice or 15 days after you request and obtain your loan file. It is a good idea to make this request so that you know what is in your file. 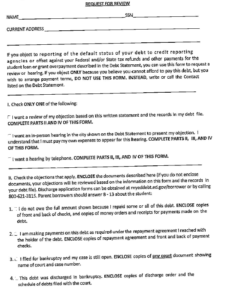 You must make a written request if you want to see the loan file and you must do this within 20 days of the notice. You can request a hearing after these deadlines, but the offset will generally not be held up while you are waiting for your hearing. The IRS provides a toll-free number, (800) 304-3107, to call for information about tax offsets. You can call this number, go through the automated prompts, and see if you have any offsets pending on your social security number. This March 2018 blog post has helpful information for borrowers about offset of tax refunds to pay student loans. Request for Offset Hearing, 970Kb.